It must have been hard to undergo tea-table-upending. There weren’t many things on the tea table. Yes. So they didn’t scatter that much. Maybe just a tablecloth and candles. You just run up those stairs, so the difficulty is the same for people who are good at games as well as for people who aren’t that good. For Luigi’s Mansion 2, we’d been told to always keep beginners in mind as we made it. In the end, I think it turned out so both skilled gamers – of course – and beginners can enjoy it. a map is always on the bottom screen . We focused on how we could make it so that beginners and advanced players could both enjoy playing it while looking at that map, and we reworked it over and over. Ikebata-san, I bet Miyamoto-san was extremely demanding and strict in asking why you weren’t making use of the advantages of the Nintendo 3DS system’s structure. After all, we’ve got that bottom screen – and I think it’s new and interesting to play while looking at a map. Looking at the map is especially important when solving puzzles in the single-player mode and in multiplayer mode. Was there a multiplayer mode from the start? Yes, there was. We decided to put in a multiplayer mode when we started the planning phase. But the original Luigi’s Mansion didn’t have that, so in that respect, you didn’t have a reference point. That’s right. There wasn’t anything at all. Actually, when making the game for Nintendo GameCube, we had experimented with a multiplayer mode in which Luigi would encounter Luigi. I haven’t seen the prototype for the Nintendo GameCube, but Hideki Konno9, the director of the previous game, had also told me that they couldn’t put in a multiplayer mode last time, so they wanted us to do it this time.9. 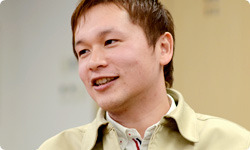 Hideki Konno: Software Development Department, Entertainment Analysis and Development Division. He has worked on such games as the Super Mario and Mario Kart series, in addition to serving as producer of the Nintendo 3DS system. 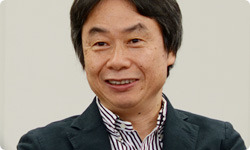 In the past, he has appeared in sessions of “Iwata Asks” covering Mario Kart Wii, the Nintendo 3DS hardware concept, Nintendogs + Cats for the Nintendo 3DS system, Mario Kart 7 (Volume 1: Joint Development with Retro Studios), and Mario Kart 7 (Volume 2: In-house Staff). The previous developer entrusted you with his hopes. Yes. Miyamoto-san got us started when he said, “It would be fun if Luigi met Luigi,” so we really puzzled over how we could achieve that and had a good time making it together. What exactly happens when Luigi meets Luigi? there’s a button for calling another Luigi . You can call him when you find something or when you want help and say, “This way!” or “Help!” and he comes to help. So when you meet Luigi, you’re happy. Yeah. It’s fun just to watch four Luigis, gripped by fear, gathering and nervously exploring. And this time, co-operative play is central, so there isn’t much competition. So when Luigis encounter each other, I think it’s incredibly pleasing. To relate one little episode, after making “Luigi’s Ghost Mansion”10 for Nintendo Land11, we changed the specifications.10. Luigi’s Ghost Mansion: One of the attractions in Nintendo Land. Players use Wii Remote controllers to help Mii characters, dressed as Luigi, find and defeat a ghost controlled by the player with the Wii U GamePad.11. Nintendo Land: A theme-park attraction game released simultaneously with the Wii U console in November 2012. It includes 12 attractions based on Nintendo franchises. In “Luigi’s Ghost Mansion,” if Luigi passes out, friends can come help. But in the sequel that we were making to Luigi’s Mansion, once he passed out, he stayed that way. So we changed it so that you could help Luigi when he passes out in multiplayer mode for this one as well. However, you use the +Control Pad to request aid, so it’s a somewhat special control. You use it to call everyone. That’s actually the only time you use the +Control Pad in this game.